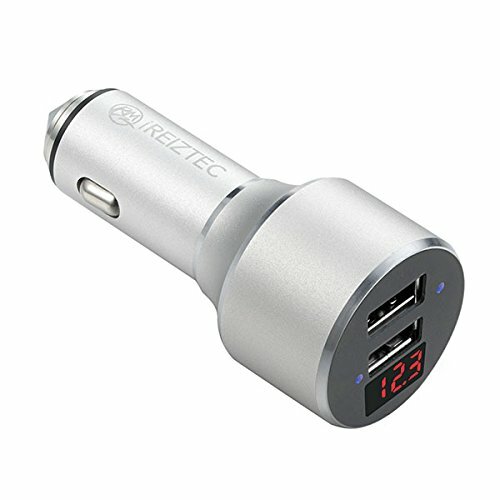 【Extremely Useful 4 in 1 Automotive Gadget】34W output Dual USB Car Charger + Low-cost Car Battery Monitor & Charging Monitor with a built-in accurate voltmeter + Solid Stainless Steel Tip end Safety Hammer. 【DUAL USB Charging Ports】 Qualcomm Quick Charge 3.0 port: Provides 4x faster charging speed to compatible devices. 2.1 A USB port charges up to 2.1X faster than usual car charger. Charge two device semiseriously at full speed. 【AMZING iREIZTEC CUSTOMER SERVICE】Lifetime Warranty ( We will send you a new one for free if any quality problem) and Friendly Consumer Service within 12 hours.